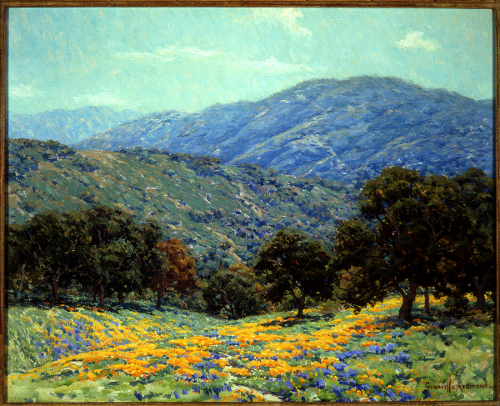 This morning I featured "California Impressionism: Selections from The Irvine Museum," currently showing at the Portland Art Museum, at The New York Sun. I am fairly familiar with California Impressionism. Most of it has a period flavor, but that Redmond painting (I had never heard of Redmond) is astonishingly realistic. I took it as a photograph at first. I'm going to check him out. I have a relative who lives in Eugene, Oregon and visited Portland over the weekend. She saw this show and liked it very much. She also called me to report that the museum currently is also showing selections from its Clement Greenberg Collection. I was very happy to hear this as they don't always. I read your review of this show in the New York Sun. Obviously, you couldn't get out to Oregon to actually see the show, so it was only natural that your "review" should read like a press release. But I have also read your "reviews" of two New York shows, both at Loretta Howard—Friedel Dzubas and Ronald Bladen (both accessible through the gallery website). Both of these shows were well worth reviewing, and I reviewed them in my column, giving my impressions and evaluation of the shows. I didn't get that from your two reviews. They read as though you were simply copying out a press release, no hint that you had actually seen the show. When I want a press release, I can go to a gallery website. When I read a newspaper, I am just so old-fashioned that I expect a review, but maybe your editors at the Sun aren't so particular. Piri, my gig at the Sun is to feature shows twice a week, not necessarily to review them. Every so often I write a proper review, which I distinguish by including in my writing archive. (Most recently, I reviewed Odd Nerdrum at Forum.) But usually I'm just bringing attention to deserving exhibitions. Yeah, well, they still read like press releases, and Loretta Howard's website still refers to them as "reviews." Do you really think it does your reputation any good to publish writing about shows you haven't seen? How do you even know the shows are "deserving" if you haven't seen them? The Dzubas show was terrific and very revelatory, but the Bladen only had 2 pix that stood out for me—I mean, maybe you would have disagreed with me, but since you didn't see the show, neither of us can be sure about that. I was up against a similar situation many years ago, when I was a stringer (journalese for freelancer) doing weekly articles on art and culture in New Jersey for the New Jersey edition of the Sunday New York Times. I would go out to Jersey on a Tuesday, write up my piece on Wednesday, and, as I recall, take it down to the Times on Thursday. This was long before email became the preferred method of delivery, but after I had been doing this for about three years, the editor of the section hired on a friend of his, another art critic whose name I won't mention. I soon discovered that he was able to get his copy in before me by the very simple method of not going to New Jersey, but writing his reviews upon the basis of phone calls to the public relations people at the museums in question. This produced some rather strange situations—most notably, I remember a press contact at the Princeton University Art Museum telling me in a rather puzzled voice that this guy's review of a show at their museum had actually described one object as "large" when in fact it was small (or vice versa—can't remember exactly). In those days, I was too timid to call him out, and anyway, I learned via the Times grapevine that they were going to revamp the section and effectively dispense with most art coverage, so I just quit—told the editor that I wanted to spend more time with my graduate school studies—which was also true, and actually of more long term benefit to me than the Times job would ever have been. It was neither the first job that I've walked away from, nor the last. I may wind up as a bag lady, but at least I like to think that I have a firm foundation for what I write. As for that other art critic, he was eventually shifted to the Long Island edition of the Sunday Times, where he surprised another woman I would later meet—she had worked at the Guild Hall in Easthampton and also learned first hand about his long-distance method of covering their shows. However, on Long Island he also encountered a whistle-blower, Helen Harrison, another stringer for the Times and currently director of the Pollock-Krasner House and Study Center. She told me that in addition to making up stuff, this guy would tell museums that if they wanted him to review a show of theirs, they should send a limo to take him to it. This is not the kind of behavior that the Times expects of its reporters—they have a long page of journalistic ethics at one of their websites (not New York Times, but New York Times Corporation, I think) and the bottom line is, you do not take money or its equivalent from subjects or sources. So this gentleman was canned—though he then managed a cushy administrative job in one of those big art schools which turn out wunderkinds who make big hits with their splashy "cutting edge" shows in Chelsea, 2 years after they take their degrees. To each his own, I guess. To be sure, the art world has its own morality, and many highly-regarded art critics make big money writing catalogue essays for galleries—but it's only critics who write for art magazines or websites (you won't find any catalogue essays from NY Times critics). Artists also write catalogue essays for galleries, and nobody thinks twice about it. But if a gallery wanted a statement from Greenberg for their catalogue, he would only allow them to quote from something he'd published elsewhere, free of charge. Or he would give them a one-sentence quote (i.e. "Olitski is our best painter"). After I got out of grad school, and began to publish writing that made people I admired pay attention to me, Andre Emmerich invited me to lunch and said how much he'd appreciate it if I'd write something about one of his artists. We ran down the list of shows scheduled for his coming season, and one of them was for Olitski. I'd been thinking about Olitski for a long time, decided I was finally ready to take him on, and decided I wanted to interview him. This was in the spring, and Jules was going to be up in New Hampshire over the summer, so I said I'd go up there to see him. Andre coughed apologetically, said something about how he knew some of these art magazines didn't pay very well, and volunteered to pay my plane fare. I thanked him, said I'd think about it, went home and called Clem. "You are paid by the magazine," he said, smoothly. "You do not take money from dealers." So I thanked Andre and paid my own plane fare. It was quite a nice article, too. Clem liked it. Jules liked it. I even got a nice letter from David Mirvish, whom I'd never heard of (I was still kind of new to the Greenberg circle, then). Of course, I don't think Clem could have said the same thing to all of the critics who shared his taste in art. I can think of at least a couple of cases where the catalogue essays for Andre's shows were identical, word for word, with articles that appeared in Arts, suggesting that whoever wrote them was paid twice. But maybe Clem was setting the bar a little higher for me. Look, Franklin, I'm not trying to tell you how to run your life. But writing about shows you haven't seen does open you up to the possibility that you won't represent them accurately. And if what you write sounds too much like a press release, it does in some minds at least open up the possibility that this is a paid insertion—which I don't think is an impression you'd like to convey. You're an ingenious writer—maybe you can think of some way to make clearer just what it is that you're doing. Too, art appreciation in general is in absolute shambles, and if this points a few people in the right direction, I'm inclined to keep at it. The Bladen show, for instance, may have been less than stellar, but I'd still wager that it was worth seeing compared to a randomly selected exhibition in Chelsea. I think I've mentioned to you in the past, Franklin, that perhaps simply copying out the press release wasn't the best idea. Since then I've noticed you always put press release copy in quotes, and when you have something to add, you add it, and it never misrepresents. You say something like, "Joe Bananas has a show. I liked Joe Bananas when I saw his work two years ago. His new show is at Such and Such Gallery. [quote press release]"
I'm not sure of the value of this, but I don't think it will lower your reputation. And, hey, it may help point some people at something more worth seeing than they'd find on a random ramble through Chelsea or the Lower East Side. I remember the exact case. Without further elaboration, I quoted the curator of the MoMA de Kooning show via a press release. According to John Elderfield, Chief Curator Emeritus at MoMA, "The importance of Willem de Kooning as one of the very foremost artists of the New York School is widely accepted, as is his revolutionary importance to modern art as a whole. Far less well understood is what his artistic career actually comprised in its almost seven decades of development. The exhibition demonstrates how de Kooning never followed any single, narrowly defined path, repudiating the modernist view of art as developing towards an increasingly refined, allover abstraction to find continuity in continual change." After you and Arthur Whitman pointed out that I seemed to agree with this, I added a small protest. Your author doubts that the modernist view dictates any such thing, but the exhibition itself promises to be a knockout. I've been more careful since then. Good grief, Piri! All Franklin did is report on an exhibition, with a couple comments and a couple long quotes, Anyone with any familiarity with the genre could say a lot more than this in clear conscience. In our hearts, we know Piri is right. There are lots of times when we must nonetheless settle for looking at reproductions to form an opinion about what is going on. But Loretta Howard? And wouldn't it be better to publish a press release as a press release, rather than wiggling it under someone's byline, especially when the "art critic" tag is added to it? If the Sun wants a show reviewed, they should send you to do it. If they want to publish the press release instead, let them do that. In an ideal world, the Sun would hire me as a staff writer and I'd file three times a week from my base in New York. Also, I would go around from gallery to gallery riding on my magic pony. I am not saying that Piri is wrong, nor that her account is uninteresting, just that it is not appropriate in the context, particularly the scolding, which personifies and particularizes an issue which did not exist in the first place. Franklin's piece was carefully neutral, no specific judgements were made, he did not say it was a review, almost half of it was quotes and the rest was something anyone half-informed about the genre could say freely. That's a tough one. As someone who has to file a weekly ToDo column I understand that it is not always possible to see a show prior to its opening. On the other hand, I have been burned by recommending shows sight unseen that turned out to be what critics used to call very, very bad. I think Franklin is doing the best he can with what he's got. As mentioned, these blurbs for the Sun aren't really "reviews" anyway, and I think the reader has some responsibility to parse the difference. I'm not saying Franklin should refrain altogether from writing about shows that he hasn't seen. But why can't he make it clear that he hasn't seen them? Otherwise, when a gallery describes the writeup as a "review," people who employ the link to read them will have been conditioned to think that this is a review. So, I suspect, will many and maybe most of the people who access the Sun website directly—few if any of them being familiar with the hairsplitting found in Franklin's defenders. At the Sun website, after all, is a line at the bottom of the review which says that Franklin is an art critic. So how about some headline at the top which says something like "Coming Attractions"? Or maybe a personal note, beginning the first sentence with something like "A show that I am looking forward to seeing is"? As I said before, Franklin, you're an ingenious writer. If you don't like these suggestions, maybe you can think of something else. I would certainly agree that plenty is written which is sheer publicity and not reviews per se, and, with most (though certainly not all) of the people who write such materials, it may not make much difference. It is only because I so much respect Franklin's criticism that I hope he will not follow what I consider a less than desirable practice. Or maybe a big headline saying "Disclaimer: I didn't really see this show. I hope that's okay." Jeez! I find it nearly impossible to read Franklin's announcement of this show, or any other similar announcements, and come away with the impression that he was writing a review. It appears that Piri's lead to this curious conclusion by a gallery listing one under a heading entitled "reviews". So, not by anything Franklin did, or did not do. I can easily see why a gallery, or an artist, might wish to present any press coverage as a "review", but the reality is, much press coverage of visual art is entirely uncritical, and hence rarely would qualify as a review, per se. If someone has an issue with a gallery misrepresenting neutral press coverage as "reviews", then is seems the logical course of action would be to complain to the gallery in question, not the blameless writer. My presumption, which may be wrong, is that Franklin gets to choose which show, out of the multitudes of press releases that must come to the Sun, merit being featured as worthwhile bets, and that his responsibility for that choice is marked by his byline. Someone else in Franklin's position, but without Franklin's good sense for art, would no doubt feature a different show from another press release, and would rightly attach their name to that choice. The readers might rightly get the impression these shows represent the kind of thing the chooser (an art critic) goes for, without coming to the dubious conclusion that anything in the piece itself is a review. Piri has made some more good points along with offering workable, positive remedies. Integrity can't be maintained by splitting hairs. From the first time I saw those Sun thingies, I thought they sure were tame, compared to what Franklin usually writes. That's the larger problem. When you use your byline, you need to be compelling, maybe flex a little muscle. Of course we can maintain integrity by splitting hairs. Seems to me that's exactly what we are doing here. And if Franklin's "thingies" are tame, perhaps that's because he is being cautious because he is not writing a review. I think the fact that this rather boring post has garnered 17 comments is indicative of the fact that Franklin is not posting enough. C'mon my good sir, get blogging already! It's true, I've been remiss in my blogging. New posts, along with some overdue explanation for the holdup, is forthcoming this week.